Posted November 8, 2015 by laurielmorrison & filed under Middle Grade Literature, Posts with specific prompts or suggestions for specific assignments, units, and books, Read Aloud, Teaching. As I’ve explained on this blog before, one of my favorite parts of teaching middle school English is reading great books aloud to students. Read alouds happen in addition to the independent reading students are encouraged to do and the whole-class novels that students read for homework and write about for grades. They are for enjoyment and conversation only. Students can choose to write about read-aloud books as they write essays on their final exams at the end of the year, and many of them do, but other than that option, I never quiz students or grade them on their comprehension or recollection of details. And even students who don’t like to read on their own often beg for extra read aloud and complain if we run out of time before getting to the next chapter or skip read aloud when we don’t have class. But it’s not easy to pick a perfect read-aloud book. I want something with crowd appeal, but that students might not necessarily select on their own. Something new, ideally, so that chances are, no one in my classes will have read it yet. Something that will lend itself to interesting, resonant discussions and encourage students to make inferences and predictions. It’s especially challenging to find something right for my eighth grade students, because there aren’t a whole lot of books out there that feel just right for eighth graders…or at least not just right to read aloud to them. Most middle grade novels feel too young, and many young adult novels might be great for them to read on their own, but I wouldn’t be particularly comfortable reading them out loud to a group of students who would erupt into giggles any time I had to say a swear word or describe any kind of PG-13 content. By August of this past summer, I’d read a whole lot of wonderful books, but nothing that felt quite right for my new seventh and eighth grade read alouds. If I were teaching younger kids, I would have seriously considered Kirsten Hubbard’s lovely and intense Watch the Sky, Cassie Beasley’s magical Circus Mirandus, Lauren Magaziner’s hilarious The Only Thing Worse than Witches, Corey Ann Haydu’s poignant Rules for Stealing Stars, or Heidi Schulz’s delightful Hook’s Revenge. If I hadn’t included it as a summer reading choice, Kimberly Brubaker Bradley’s beautifully written and compelling historical novel, The War that Saved My Life, would have been a contender. But I was still stuck. Luckily, toward the end of August, as my remaining vacation time dwindled, I found two promising titles on NetGalley that were coming out in September, and both turned out to be exactly what I was looking for. 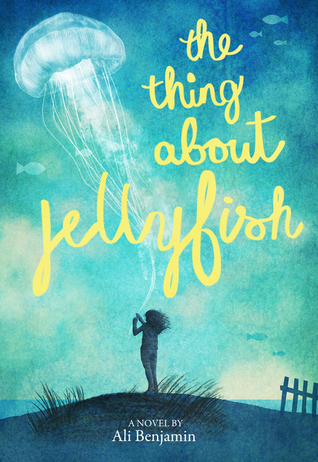 For seventh grade, I settled on Ali Benjamin’s powerful novel The Thing about Jellyfish. I hadn’t heard about it before I found it on NetGalley, but clearly my students and I aren’t alone in thinking it’s excellent because it’s now a finalist for the National Book Award. The Thing About Jellyfish is a grief story: twelve-year-old Suzy Swanson has refused to engage in “small talk” since her estranged best friend, Franny, drowned in the ocean over the summer. Suzy has plenty of people who want to help her to heal—both of her parents, her brother, her therapist, her science teacher, and her lab partner—but Suzy shuts them out because she thinks she knows the one way she can make things better. When Suzy learns about the deadly Irukandji jellyfish, she believes she can prove that a jellyfish killed Franny, and then she won’t have to accept her mom’s unsettling “sometimes things just happen, so Franny drowned even though she was a great swimmer” explanation. The book is divided into sections based on the parts of the scientific method, and Ali Benjamin weaves in flashbacks that show different stages in Suzy and Franny’s friendship and lead the reader toward an understanding of what happened between the girls on the last day of sixth grade. Suzy is an endearing narrator who insists on thinking rationally and scientifically about topics that defy logical explanation. My students like guessing what happened between Suzy and Franny, and, thanks to Benjamin’s nuanced portrayal of Suzy’s character, they like Suzy, root for her, and feel heartbroken for her while also finding her amusing and frustrating at times. 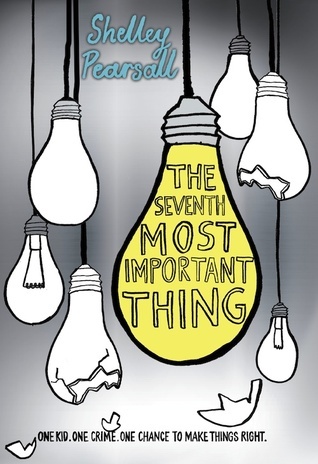 For eighth grade, I chose Shelley Pearsall’s The Seventh Most Important Thing. The Seventh Most Important Thing is set in Washington, D.C. in the 1960s. The main character, Arthur Owens, is said to be fourteen but in seventh grade; I wish he were in eighth grade since some of my students aren’t crazy about reading about characters who are in younger grades and since fourteen-year-olds tend to be in eighth grade, not seventh. But Arthur feels like an eighth grader, and I haven’t had any trouble getting students to buy into his story. Like Suzy Swanson, Arthur is also grieving; Arthur’s father died a few months before the book begins. When his mother, who is angry with his father for throwing his life away, gets rid of all of his father’s things, Arthur sees the “Junk Man,” who picks through the neighborhood trash, wearing his father’s hat. Furious, Arthur throws a brick at the man and then ends up working for the man collecting seven strange, “important” things as his punishment. The Junk Man, James Hampton, is a real, fascinating historical figure, and I admire Shelley Pearsall’s creativity in bringing his story to life and imagining his connection to a vulnerable but resilient teenage boy. Students have enjoyed puzzling out the bizarre tasks the junk man asks Arthur to complete and attempting to decode his strange way of speaking. The book has terrific art and history tie-ins and an engaging cast of secondary characters. I highly recommend both, whether you’re reading aloud or not! So glad your students love when you read aloud. I totally get the need to search for a book that seems right for them. The ones you chose sound great. I’d heard about the jellyfish book, but was not familiar with the Shelley Pearsall book. I’ll have to look for those! I love your read aloud recommendations. They’re always high on my list. Thanks, Laurie!